When Cyrus the Great, the Persian King of kings, conquered the kingdom of Lydia in Asia Minor in 546 B.C., he also gained nominal control over the Greek cities along the Mediterranean coast, a region known as Ionia. As far as the Greeks were concerned, the change in masters made little difference. As subjects of Croesus, the king of Lydia, they had largely been left to handle their own affairs with little or no interference. At first, the new Persian overlords also followed such a policy of non-interference – provided they paid their taxes and contributed to the Royal army (or to be more precise, the Royal navy). As in the rest of their empire, the Persians did not interfere with the local governments and customs of their newly acquired Greek cities. Consequently, the Greeks themselves were content to remain within the empire, particularly since the pax Persica proved good for trade and business. The death of king Cambyses in 522 B.C., and the accession of Darius to the Persian throne, brought important changes to the Greek cities in Asia Minor. Darius faced internal rebellions and opposition and was able to assert his authority only after years of fighting. When secure, he began the reorganization of the empire, especially imperial finances. As taxes rose substantially, the Ionian Greeks began to chafe at their subjection - a feeling made worse by the political developments they could see on the Greek mainland. In 499 B.C., under the leadership of the city of Miletus, the Asiatic Greeks revolted. They appealed to the cities of mainland Greece for help but only Athens and Eretria responded favorably -- and modestly (Athens with twenty ships, Eretria with five). It soon became clear that the Greeks of Ionia had misjudged the will and resources of the Persian Empire. By 494 the revolt was crushed, the city of Miletus destroyed, her population deported or sold into slavery. Even before the revolt of Ionia, Darius had been active on the European continent. In 512 B.C. he had led an expedition into Thrace and across the Danube, establishing Persian imperial rule in the areas of southeastern Europe that bordered the northern coast of the Aegean. He had also been active diplomatically in Macedonia, which eventually submitted to his authority as a client state. Now he had a reason to interfere in the Greek peninsula as well, to punish Athens and Eretria for their support of the Ionian rebels. In 490, he sent a Persian army under the command of one of his generals across the Aegean. After destroying Eretria, the Persians landed on the coast of Attica at Marathon, some twenty miles from Athens. There, to the surprise of all, the Athenians defeated the Persian forces and pushed them back to the sea. Marathon became a legendary battle, the victory of the small, proud, and democratic city of Athens against the huge, autocratic Persian Empire, a turning point in western history. As Herodotus (484- 430/420 B.C. ), the Greek historian of the Persian wars, described it, the Athenians had preserved the freedom of the Greek world. In reality, for the Persians the defeat at Marathon was only a minor set-back, although a rather humiliating one. Once he learned of the outcome, Darius decided to correct his general's mistake by personally leading a massive invasion of Greece by land and sea. After three years of planning, however, in 486, distracted and depressed by a rebellion in Egypt, Darius himself died. His heir, Xerxes I, ascended the throne. Although determined to continue with his father's plans for Greece, Xerxes first had to contend with a rebellion led by his half-brother, as well as provincial revolts, before any overseas campaigns could begin; the invasion of Greece had to be postponed for another six years. By 480 B.C., Xerxes was finally ready to punish the Greek city-states and firmly establish Persian imperial rule in southeastern Europe. Deciding to invade Greece overland, he moved his huge army to the Hellespont, the narrow body of water known today as the Dardanelles that joins the Sea of Marmara and the Black Sea to the Aegean Sea, separating Europe and Asia. To cross the straits, he had his engineers construct a remarkable pontoon bridge. After laying boats side by side all the way across the channel and lashing them together, the Persians then built a roadway over the boats wide enough and strong enough to accommodate the whole army. Once across, Xerxes marched his troops west then south along the coast to invade Greece, while just off-shore the Persian fleet protected the army's flank by sea. In spite of the heroic sacrifice of the Spartans at Thermopylae, the Greeks were unable to stop the Persian advance into Attica or to save Athens from destruction. Nevertheless, Leonidas and his men had gained valuable time in which the Athenian general, Themistocles, was able to organize his naval forces and to lure the Persian fleet into a trap in the bay of Salamis. The narrow waters of the strait made the Persian ships easy targets for the Greeks. From a throne set high atop the coastal plain, Xerxes watched with horror the destruction of his navy and with it his dream of incorporating Greece into the empire. Leaving a powerful army in Greece, Xerxes himself returned home. The next year (479 B.C. ), however, the largest combined army of Greek hoplites ever assembled soundly defeated the Persians, killing their commander in the process, at the battle of Plataea. About the same time, across the Aegean the combined Greek fleet also managed to destroy the last remnants of the Persian navy at the battle of Mycale. Against all odds, the Greeks had defeated the greatest empire so far seen in Europe or southwestern Asia. Although the war with Persia dragged on for another 30 years or so, the advantage and initiative had shifted to the Greeks. Victory over the mighty Persian Empire gave the Greeks a feeling of superiority and a chance to develop their own civilization. Indeed, the century after the Persian Wars was to be the greatest moment of Greek civilization. At the same time, however, success against the common enemy also laid the seeds of internal strife among the allied Greek city-states. As the external threat diminished, so too did the commitment of some cities to the alliance. Old rivalries among the city-states began to re-emerge. After 478, for example, many cities became disillusioned with Sparta's leadership and the alliance began to fall apart. As many of the Greek cities began to complain of Spartan leadership, eventually Sparta withdrew. Yet despite their victories, most Greek city-states realized that the need for co-operation remained critical. Xerxes' defeat had triggered another revolt of the Ionian Greeks, who once again looked to their mainland 'cousins' for help. At the same time, Persia itself was little affected by the failure of the campaign of 480-479 B.C. Although Xerxes' successors proved to be weaker leaders, and the lessons of Marathon, Salamis, and Plataea had effectively destroyed Persian dreams of western expansion, the empire remained powerful and threatening. To counter the on-going threat, most of the Greek cities joined a new alliance under Athenian leadership. The Delian League, as the new alliance was called, included most of the Greek cities and islands of Asia Minor, the Aegean, and the Black Sea. Indeed, at its peak the League included more than 140 cities.Annual contributions from all the member city-states to a central treasury on the island of Delos financed the League and paid for its military activities. Under Athenian leadership, over the next 30 years or so the Delian League forced the remaining Persian forces to retreat from Europe and the Aegean, and even from Ionia. By about 450 B.C., the war had ended victoriously for the Greeks, although even after peace had been established Persian rulers would continue to meddle in Greek affairs for another 150 years. Ironically, however, the allied cities of the Delian League soon discovered that they had simply exchanged one master for another. From Delian League to Athenian empire. At first, the member city-states of the Delian League were independent and on equal terms with all the others, Athens included. Soon, however, Athens began to transform the alliance into a virtual Athenian empire. Forbidding cities to withdraw from the league, and even forcing neutral cities to join the alliance, Athens essentially transformed allies into subjects. Illustrating the nature of her superior position and power, Athens transferred the League's treasury from Delos to Athens itself, and began using the annual tributes for her own advantage. Although the Athenians did use the alliance to keep the Persians out of the Aegean, to clear the western Mediterranean of piracy, and to insure stability and economic prosperity for the whole region, the members of the League paid for these advantages with their independence. In exchange for protection and prosperity they had unwittingly acquired a master. The Athenians are not obliged to give the allies any account of how their money was spent provided that they carried on the war for them and kept the Persians away. They do not give us a single horse, nor a soldier, nor a ship. All they supply is money and this belongs not to the people who give it, but to those who receive it, provided they provide the services they are paid for. (Plutarch, Life of Pericles 12.3). Ironically, in addition to the development of Athenian imperialism, the fifth century also saw the simultaneous triumph and completion of Athenian democracy. Under the leadership of Pericles, one of the greatest Athenian orators, a politician of great vision and probity, who dominated the city and its empire for more than thirty years from 361 to 329 B.C., ("The Age of Pericles") direct democracy reached its height. The assembly of the citizens (the ecclesia) was the sovereign organ of the state: the citizens controlled all legislative and electoral matters. Domestic and foreign matters were decided by the assembly without intervention of "professional politicians", government, or elected representatives. The principle of one citizen, one vote was paramount, without limits. In the assembly everybody could take the floor to propose a bill or to give his opinion on one that had been proposed. But Athenian democracy did not mean popular anarchy: no proposal could be presented without the Council of Five Hundred's intervention: this avoided frivolous propositions and made it possible to present propositions in due form for the people to vote. However, the people could veto, change, or return the proposal for further consideration. The Council was only there to channel the will of the people not to direct it. Moreover, the Council of the Five Hundred itself was made up of citizens chosen by lot. With few exceptions (notably in military matters) all public functions were assigned to citizens by lot. For the Athenians the lot was the only democratic way to ensure the participation of all citizens in the management of public affairs. Elections, they believed, depended too much on influence, reputation, and even the mastery of oratory. There was also the problem of bribery. Every year about 1000 public officials were chosen from the people. No one could repeat the same office and to make it truly democratic all public officers were financially compensated (if political participation were to cost the officers, the Athenians claimed, only rich people would care to take these responsibilities). Thus, both the legislative and the executive functions of government were in the hands of the people without intermediaries. Even the Judicial system rested totally in the hands of the citizens. Each year, 6000 judges were chosen by lot from a list left open to anybody who might be interested. To avoid financial burdens, judges too were paid at public expense. The system consisted of a public prosecutor, public judges, and public lawyers. Each side presented its case (without rules of evidence and relevance) to a panel of jurors who decided without professional intervention. It was a truly popular system of justice with few technicalities and little professionalism. Since their establishment, Athenian democratic institutions have been the object of serious criticism. Socrates, Plato, and Aristotle for example had few good words to say about what they considered the "rule of the mob" (ochlocracy). In fact, until the nineteenth century, very few writers gave any credit to the Athenian institutions, preferring to praise the Spartan regime. Some criticisms of Athenian democracy are unfair. Complaints, for example, that women, legal foreign residents, and slaves had no political rights may be true – but are essentially anachronistic, implying that a modern ethical and moral sensibility should be applied to the past. Slaves have never had the franchise in any society, ancient or modern; nor are legal foreign residents given voting rights today. And it is only within the last century that women have received full political equality even in Western civilization – while in much of the non-Western world alternative notions of male/female divisions of rights and responsibilities remain problematic from the Western perspective. Similarly the criticisms against the “amateur” character of Athenian democracy should be carefully considered: there existed a series of checks protecting the city from incompetent or irresponsible citizens given responsibilities by the lot: they were always working in a collegial group of fellow citizen-officials and submitted to strict scrutiny before, during, and after their year in office. In fact, it should be pointed out that the Athenians themselves would be quite surprised to see our political system given the name of democracy (even the United States): for them representative government, non-elected public servants, professional administrators, life-tenure judges, the absence of systematic accountability at the end of a term of office, even separation of powers, were not democratic principles. Only direct and full sovereignty of the majority of the citizens was the sign of true democracy. Also, it is important to bear in mind the small size of the citizenry, the social cohesion of the world of the polis, and the relative simplicity of public affairs in 5th century Greece. The system forced the common man to be involved and knowledgeable about public affairs since the lot was likely to give him important and diversified kinds of political responsibilities. This is not to say that Athenian democracy was without faults or limitations. Certainly the wealth obtained from Athens's empire and the fact that slaves could free citizens from many of their daily domestic obligations helped the citizens to participate directly in politics – and in the process tended, however unwittingly, to undermine the very foundations of the polis, which were rooted in ideals of political independence, and the self-sufficiency and self-reliance of the city-state. Let me say that our system of government does not copy the institutions of our neighbours. It is more the case of our being a model to others, than of our imitating anyone else. Our constitution is called a democracy because power is in the hands not of a minority but of the whole people. When it is a question of settling private disputes, everyone is equal before the law; when it is a question of putting a person before another in positions of public responsibility, what counts is not membership of a particular class, but the actual ability which the man possess. No one, so long as he has it in him to be of service to the state, is kept in political obscurity because of poverty... Here each individual is interested not only in his own affairs but in the affairs of the state as well; even those who are mostly occupied with their own business are extremely well-informed on general politics -- this is a particularity of ours; we do not say that a man who takes no interests in politics is a man who minds his own business; we say that he has no business here at all.... Taking everything together then, I declare that our city is an education to Greece, and I declare that in my opinion each single one of our citizens, in all the manifold aspects of life, is able to show himself the rightful lord and owner of his own person, and do this, moreover, with exceptional grace and exceptional versatility. Pericles' poignant oration should not be seen as a reflection limited to the Athenian political system. 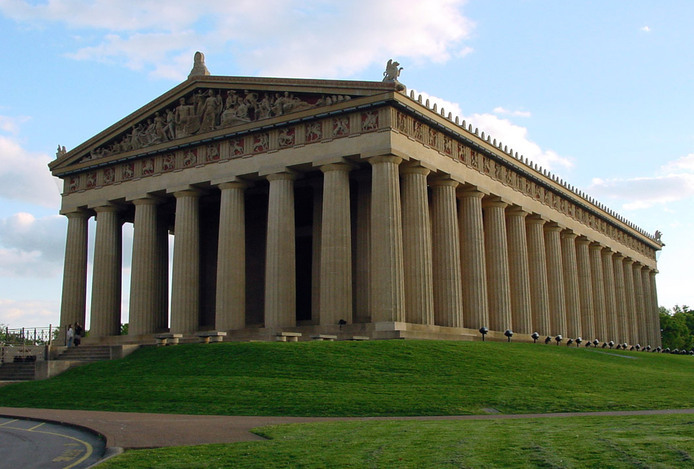 It is a powerful statement of faith in human nature, a vision of man that was the product of fifth century Athens. Despite Pericles’ gifts as an orator and an architect of Athenian democracy, his foreign policy would soon lead not only to the downfall of Athens, but also to the beginning of the downfall of Greek civilization itself – at least the concept of Greek identity and civilization that was rooted in the sacred nature of the polis. As Athenian statesmen transformed the Delian League into an Athenian Empire, they were striking at the very foundations of the polis as an independent and self-sufficient entity. Not only did they curb the independence of their subject cities by dictating all policy decisions (particularly the use of the League treasury) and forbidding them the right to secede, they also undermined Athens’s own independence and self-reliance by making her more and more dependent on the resources and financial contributions of the other cities they controlled. Personally I have had occasion often enough already to observe that a democracy is incapable of governing others, and I am all the more convinced of this when I see how you are now changing your minds about the Mytilenians. Because fear and conspiracy play no part in your daily relations with each other, you imagine that the same thing is true of your allies, and you fail to see that when you allow them to persuade you to make a mistaken decision and when you give way to your own feelings of compassion you are being guilty of a kind of weakness which is dangerous to you and which will not make them love you any more. What you do not realise is that your empire is a tyranny excercised over subjects who do not like it and who are always plotting against you; you will not make them obey you by injuring your own interests in order to do them a favour; your leadership depends on superior strength and not on any goodwill of theirs. And this is the very worst thing - to pass measures and then not to abide by them. We should realise that a city is better off with bad laws, so long as they remain fixed, than with good laws that are constantly being altered, that lack of learning combined with sound common sense is more helpful than the kind of cleverness that gets out of hand, and that as a general rule states are better governed by the man in the street than by intellectuals. These are the sort of people who want to appear wiser than the laws, who want to get their own way in every general discussion, because they feel that they cannot show off their intelligence in matters of greater importance, and who, as a result, very often bring ruin on their country. But the other kind - the people who are not so confident of their own intelligence - are prepared to admit that the laws are wiser than they are and that they lack the ability to pull to pieces a speech made by a good speaker; they are unbiased judges, and not people taking part in some kind of a competition; so things usually go well when they are in control. We statesmen, too, should try to be like them, instead of being carried away by mere cleverness and a desire to show off our intelligence and so giving you, the people, advice which we do not really believe in ourselves. While the Athenian empire was thus proving restive, the other city-states of Greece were also viewing Athens’s actions with growing alarm and suspicion. Corinth in particular feared the growth of Athens’s sea power. 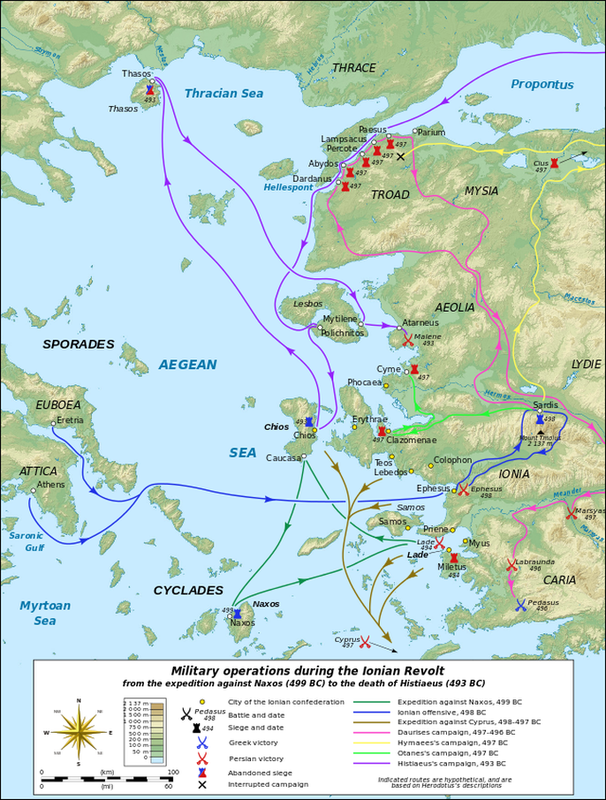 Under Pericles, the Athenian navy dominated the Aegean, including the trade routes that linked the Greek cities of Sicily and other colonies to the cities of the Peloponnesus. Such overwhelming naval power represented a potential threat to those cities, like Corinth, that also looked to the sea for their survival and prosperity. As rivalries thus grew between Athens and the other cities of Greece, the opponents of Athenian power soon looked to Sparta to lead them in what became known as the Peloponnesian League, a counterweight to Athens’s Delian League. Sparta’s leadership of the coalition against Athens was no coincidence. Sparta and Athens had long been rivals in Greece. In many ways they represented completely opposite views and ways of life. The Athenians extolled democracy and cultivated trade, manufacturing and the arts. They looked to the sea as their primary source of wealth, and their navy was their primary source of power. Sparta on the other hand, remained an agrarian-based society ruled by kings, and maintained an autocratic military state, depending upon their army to maintain their power and protect their land. Athens valued the leisure arts – architecture, sculpture, music, poetry and the quest for knowledge in philosophy and science – as the hallmarks of civilization. Sparta valued simplicity, the ability to withstand hardship, military discipline and prowess in battle, and courage as the basis of a healthy state. Neither liked nor trusted, nor indeed understood the other. As Greece divided between the Delian League and the Peloponnesian League, the rivalry finally broke into open conflict. After a series of lesser conflicts, eventually full-scale war broke out between Sparta and her allies and the Athenian empire in 431 B.C. For the next thirty years the conflict raged, not only involving Greece but also the colonies in Sicily and the Greek cities of Ionia. Eventually, Persia too entered the war by providing aid to Sparta. In 401B.C. the war finally ended when Athens fell to the Spartans and their allies. Stripped of her fleet and her empire, Athens was reduced to a third rate power in Greece. But the conflict had weakened all of the city-states and significantly reduced the populations of many poleis. In what had amounted to a civil war, the Greeks had undermined all their gains against the Persian threat and even after the end of the war they could not achieve unity or true peace. Over the next seventy years, Sparta, Athens, and the rising new power of Thebes struggled, plotted and connived to dominate Greek affairs. Ironically, the real winner of the Peloponnesian War proved to be the Persian king, who eventually became the arbiter among the feuding Greek states.